the Muslim Mozárabes from southern Spain who reputedly introduced grapevines that originated in North Africa – merely as a source of fresh fruit. With a long history of regional refinement, these adapted cultivars of Verdejo are now considered indigenous – producing crisp, aromatic and characterful wines! 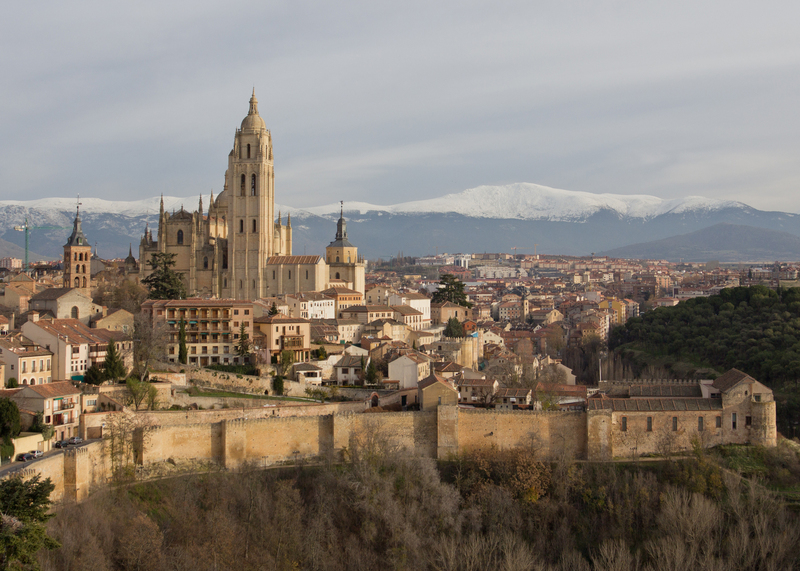 With a distant heritage of mainly outputting Palomino Fino sherry, the 74 towns and villages of Castilla y León’s central province of Rueda has gradually become the world’s epicenter for the production of Verdejo white wine styles. Here on a high-altitude and rocky plateau, 90% of the 13,000 hectares is solely dedicated to Verdejo vine stock; topped-off by small lots of Sauvignon Blanc and Viura that are mainly employed in blends such as Verdejo Blanco. 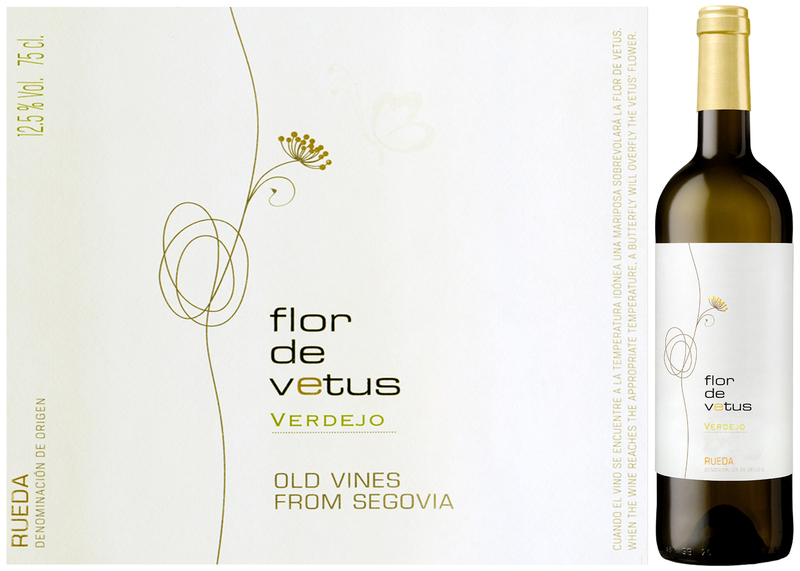 For this DéClassé feature of Flor de Vetus Verdejo 2015, the varietal wine’s slow-ripening fruit has been sourced from older bush vines of a single vineyard. Despite still being a young winemaking enterprise that was only established in 2003, Grupo Artevino and their Bodegas Vetus shrewdly continue to build on their portfolio; selecting land plots according to suitability for each particular grape variety. Judging by the results demonstrated in this satisfying bottling, the property near Segovia is a real winner for Verdejo. As 2016 comes to a close, what remains true is that North American markets are still very slow to embrace white wines other than the enduring stars such as Chardonnay, Sauvignon Blanc, Pinot Grigio and Soave. So, with a view to newer possibilities in 2017, and a spirit of expanding your predisposed tastes, add Spain’s Verdejo to your DéClassé-recommended listing of alternate dry whites: Pecorino, Picpoul, Gavi di Gavi, Muscat, Coda di Volpe, Grüner Veltliner, and Vouvray/Chenin Blanc! This is a zippy and vibrant, dry white that’s tinged with subtle herb, citrus and mineral notes accenting its medium body full of tropical fruit and melon. As with food pairings that might suit more-fulsome versions of Sauvignon Blanc or Pinot Gris, try serving this Verdejo with savoury canapés, Caprese salad, seafood such as shellfish and oysters or pan-seared trout with lemon butter and almonds. Despite averaging only 175km in width over a 4,270km length that crosses 38 degrees of latitude, the long and narrow winemaking map of Chile has recently been redrawn, laterally — to better reflect the geographic and climatic diversity, and its relationship to viniculture. Previously, categorizing the various valley regions was simply determined by whether they lay either north or south of the country’s middle; a temperate zone around the capital, Santiago de Chile, and the nearby vineyard tracts in Valle del Maipo – the historical heartland of a wine industry whose heritage dates to the 16th century. With significant expansions of estates in the 1980’s and 90’s, including the development of many areas that had been dismissed as unsuitable for grapevine cultivation, Chile’s sophisticated viticulturists have come to understand that the pertinent distinction between terroirs lies in their east to west orientation. The three new categories now being promoted are Costa – the coastal areas along the edge of the Pacific Ocean that are equally conducive to red and white, cool climate varieties; Entre Cordilleras — the central valleys whose vines tend to produce medium-bodied red wines, and Andes – the foothills of the Andes Mountains that are the surprising source for Chile’s trademark, full-bodied reds. As these new markers are gradually beginning to appear on Chilean wine labels, the vintners’ aim is to provide savvy consumers with some additional insight into Chile’s impressive and ever-expanding range of regionally expressive wine styles! One of the youngest Costa wine regions is the San Antonio Valley, which in turn, is made up of a collection of branch valleys: Rosario, Malvilla, Cartegena, Lleoleo, Lo Abarca and the source of this week’s DéClassé featured wine — Leyda. This valley’s floor sits on top of a dry, ancient riverbed that accumulated its desirable loam soil over millions of years: a silt mixture of sand, clay, and crushed granite. Somewhat ironically, given that it lies just 10km inland from the ocean, this is generally arid terrain. However, since 2001 the inventive wineries of Leyda have been building pipelines to access water from the Maipo River and using the precious resource to feed their modern/sustainable drip irrigation systems. 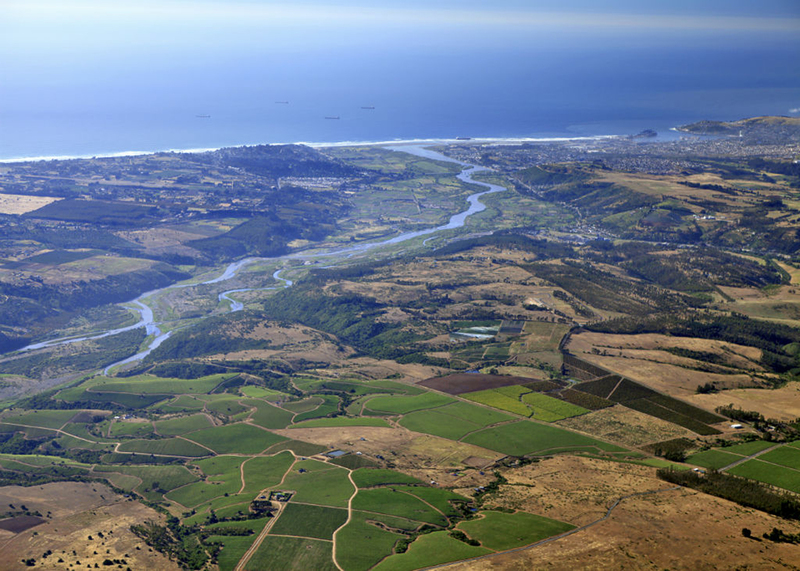 With a climate influenced by the valley’s 100-meter altitude, and the daily cycle of fog-bound mornings giving way to sunny afternoons caused by the Humboldt current of the Pacific, the weather factors combine with the mineral-rich soil base to create an ideal terroir for the cultivation of Sauvignon Blanc, Chardonnay — and now 15-years-on from its earliest plantings, Pinot Noir. 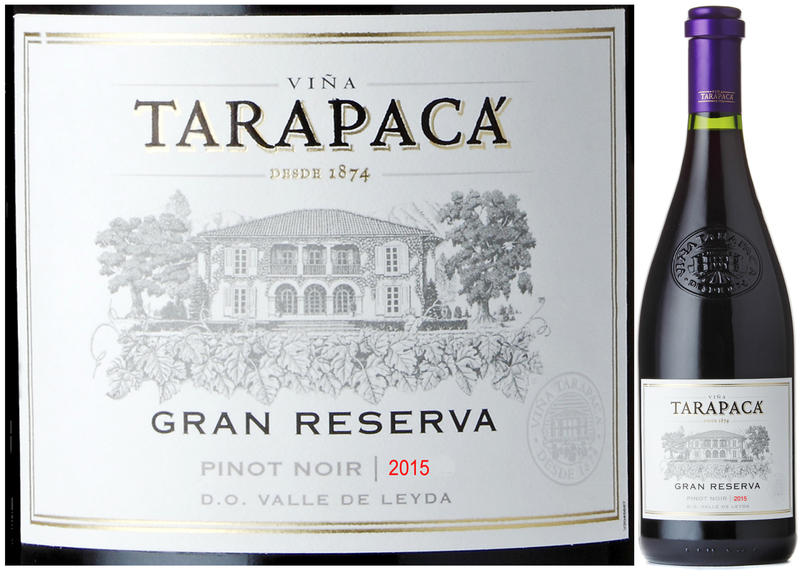 With this Viña Tarapacá Gran Reserva Pinot Noir 2015 serving as one compelling example, Tarapacá’s winemakers are capably producing price-competitive, premium versions of a wine style that is commonly and unjustifiably overpriced by many European and North American producers. Apart from its appealing price, the real charm lies in having achieved a balance between a vibrant fruitiness while not belabouring Pinot Noir’s elegance as a mid-weight wine style. Buy 3 today; to serve before, during, and after a very special Christmas dinner tomorrow! This Chilean Pinot captures many of the bright berry fruit aromas and flavours that are typical of the region, with spice and vanilla notes well-integrated into its structure of smooth tannins. Try serving with grilled duck breast and beetroot, beef tenderloin and mushrooms or seared salmon and a crisp parsnip salad. celebrating Christians immediately began fermenting wine from grapes again! Throughout the first half of the 20th century, not uncommon in the wine world of the age, Yecla was outputting bulk wine with high alcohol content. As part of a 50-year transformation in Spain’s winemaking, Bodegas Castaño is a regional leader among 11 family estates that comprise the Yecla DO. Here in the high, dry zone of Campo Arriba, traditional practice is being re-energized by innovation such as cold processing. 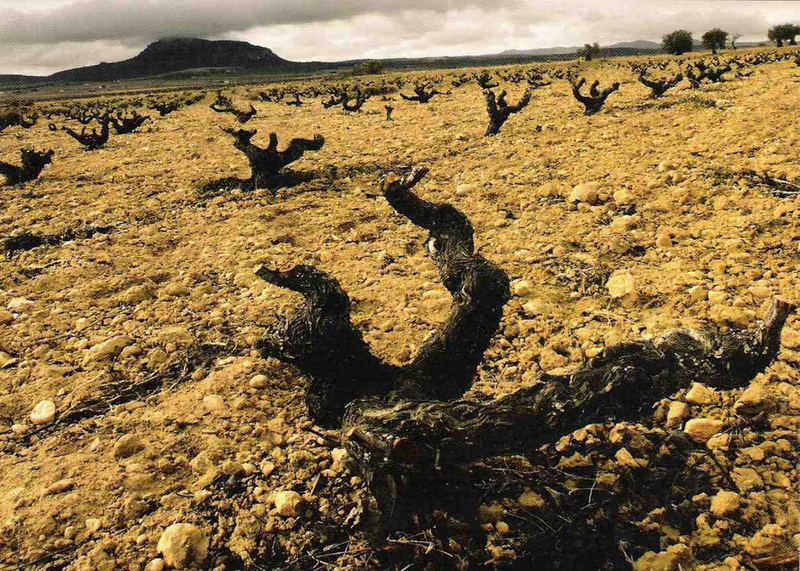 Their mastering of a difficult terrain with low organic content and arid 40° climate presents obvious challenges, but it also reveals an underlying strength: gnarly, old bush vines, whose rootstock was less-affected by the Phylloxera scourge that wiped out most of Europe’s vines in the late 1800’s. In being both aged and stressed by the conditions, the vines produce low yields of quality grapes, lending a regional distinctiveness to the wine. 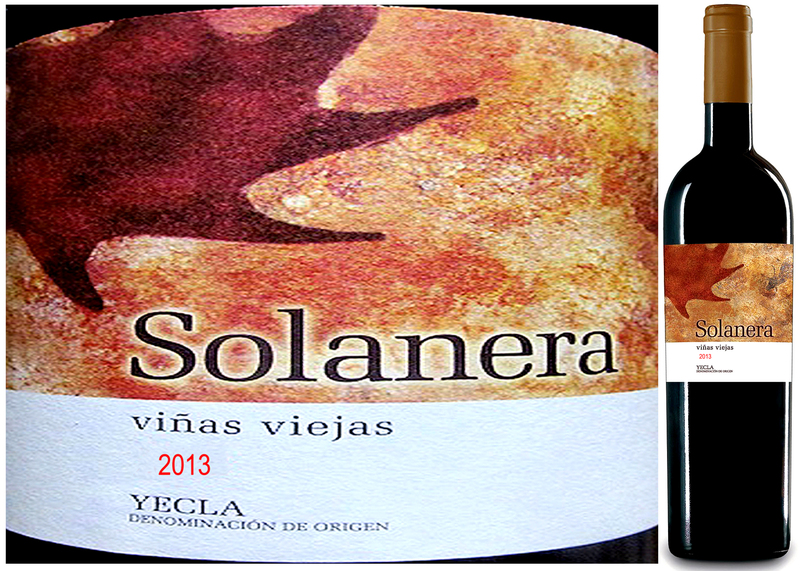 To craft the 2013 vintage of their Solanera specialty line, the Castaño vintners blend 70% Monastrell (Mourvèdre) with 15% splashes of both Cab Sauvignon and Garnacha Tintorera (Grenache). Monastrell is the star here, despite taxing the grower’s patience with its slow and long arc of development before reaching maturity. Typically harvested in mid-October, the prolonged growing period of the grape pays off by providing a broad profile of flavour and structure for the base wine; requiring less help from other varieties to round out the balance. As referenced in the wine name’s byline, Viñas Viejas, the fruit clusters are being drawn from some of the oldest stock in the vineyard, resulting in an appealingly rustic wine style that’s purposefully bottled unfiltered. With this introduction, I suggest you immediately check the LCBO’s online search (see link in the margin) for the availability of this limited release, then sprint to the location and buy as much as you can afford. It’s ready now. Decant for an hour. It will cellar for another year or so, though you’ll find it hard to hold past New Years! With substantial aromas and flavours of acacia flower, berries, and black currant, try serving this fulsome and slightly smoky wine with richer food fare such as braised duck or beef short ribs, steak au poivre or spicy pork sausages with a wild rice blend and grilled portobello mushrooms.